High impact resistant black handle made of synthetic material. The blade shape finds its origin in Japan. 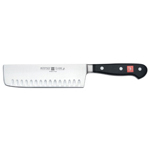 A versatile vegetable cleaver for slicing, dicing and chopping even large vegetable. Soft and hard. A pleasure to use for fruit as well. Thanks to the thin and wide blade it produces very fine and even cuts . The hollow edge prevents thin slices from sticking to the blade.The blade can be easily controlled. And like all WÜSTHOF knives the sharpness of the Nakiri can be easily maintained by using one of the WÜSTHOF sharpening tools.